What do you do when a particular recipe hinges on a key ingredient that you cannot seem to find? How about, grow it yourself. That's exactly what I did. Yes, this year in addition to the cast of regular characters growing in containers on my patio - Italian basil, parsley, oregano, and cilantro - I added Thai basil to the mix. 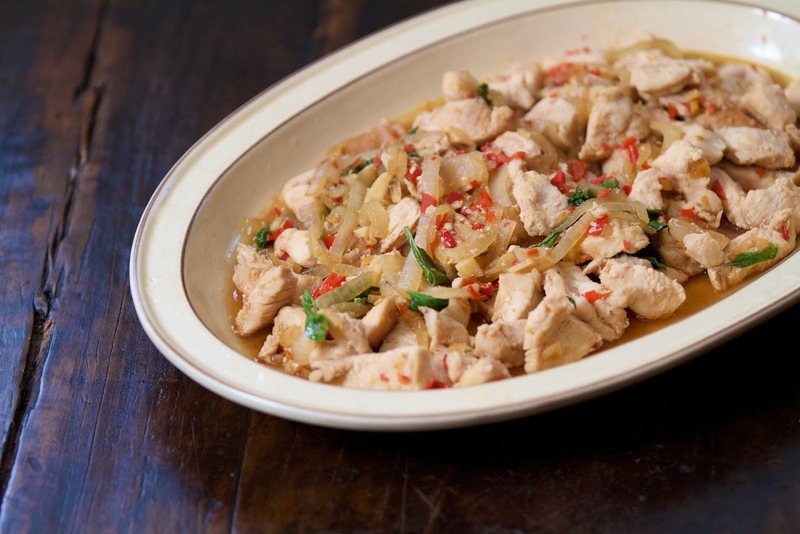 The singular reason was so I could recreate the Thai Chicken and Basil dish from my go-to local Thai restaurant. I could never find Thai basil, let alone the harder to find Holy basil, in any of my local markets. This year I saw one of my seed catalog companies was offering Thai basil and I immediately placed my order. Now I would have no excuse to not attempt my own version of the recipe. Both Thai basil and Holy basil are used widely in Southeast Asian cuisine. They offer a different taste than the basil most of us know and love. Thai basil has a slight licorice-like flavor and is a little bit spicy. Now, I know that Thai Chicken + Basil is usually made with Holy basil, but Thai basil still gives you a similar flavor, it's just a bit more mild. This dish is the perfect combination of spicy, sweet and savory. 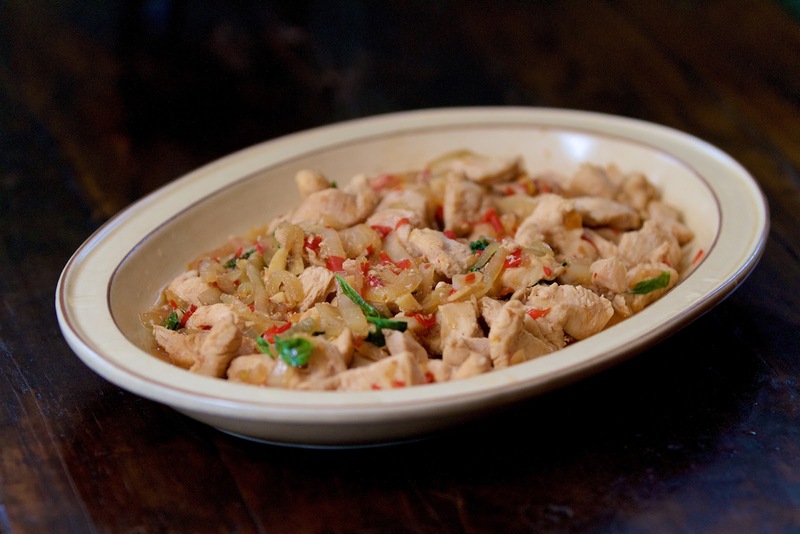 The two key flavor components come from (obviously) the Thai basil, but also from fish sauce. Don't skip the fish sauce. The fish sauce gives the dish a background savory quality. It's readily available at most supermarkets in the International aisle. Find it. Use it. Normally served over jasmine rice this recipe should feed about 4 people. I will note however that Renato and I went without the rice and scarfed down the entire recipe by ourselves. Cut chicken into thin slices. Then cut unto 2-inch pieces. Place in a large bowl with the water, fish sauce, soy sauce and black pepper. Let marinate for about 20 minutes. Heat a wok or heavy skillet over high heat. Add the coconut oil and heat until hot. Add the onion and stir-fry until translucent. Add the garlic and Serrano chilies stir-fry until the garlic pieces are lightly golden. Using a slotted spoon add the chicken to the wok, saving the marinade. Cook the chicken pieces about 3-4 minutes, stirring constantly to prevent sticking until the chicken is opaque. Add the marinade to the wok and stir-fry until combined. Add the basil and stir-fry 30 seconds until wilted. Serve immediately with a side of rice. Have you ever decided to grow a special ingredient for one of your favorite restaurant meals?